“Compromise … or you risk it all,” the president of the United States warns an ideologically rigid member of his own party—and no, you haven’t just walked into a Campaign 2012 reality show. 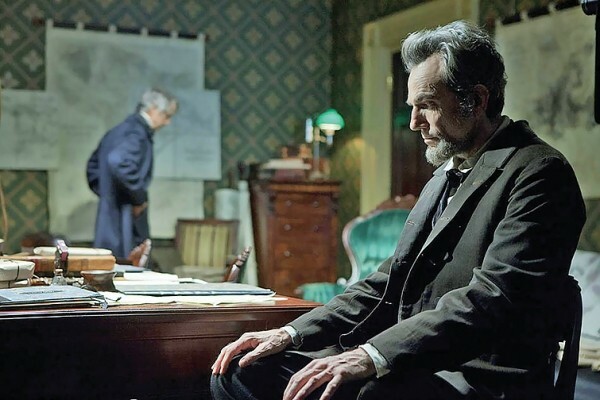 The setting is January 1865, in Steven Spielberg’s grandly intimate Lincoln, and it’s Abraham Lincoln (Daniel Day-Lewis) trying to shore up support for the 13th Amendment to the Constitution—the abolition of slavery—from Pennsylvania congressman Thaddeus Stevens (Tommy Lee Jones), a staunch abolitionist who wants to insist not just on the end of slavery, but full citizenship for all free people. And he should be one of the easy ones to convince. The release of Lincoln at the end of another bitterly divisive election cycle is a savvy move for this fascinating exploration of realpolitik, based in part on Doris Kearns Goodwin’s book Team of Rivals. Far from the cradle-to-grave biography suggested by the title, Lincoln, in fact, focuses narrowly on a few months in early 1865 as Lincoln makes the passage of the 13th Amendment in the House of Representatives the repository for all the political capital from his re-election. But first he has to placate the radical wing of his own Republican Party, led by Stevens. Then there are the more conservative Republicans, who insist on attempts to negotiate peace with the Confederate States before pushing for abolition. And even if Lincoln manages to keep his majority in line, he’ll still need defectors from the minority Democrats in order to reach the Constitutional-required two-thirds approval. That’s a lot of back-room dealing to keep straight, and it’s a fairly remarkable achievement that Tony Kushner’s screenplay doesn’t merely make it evident who all the players and their respective positions are, but does so with lively dialogue. Kushner steers us through the work of the trio of political fixers (James Spader, John Hawkes and Tim Blake Nelson) the Lincoln administration hires to offer government jobs to lame-duck Democrats as incentive to vote “yes.” He lets us observe as Lincoln’s own cabinet argues against making abolition a priority over ending the bloody Civil War, and gives us a terrific scene in which Stevens browbeats a Democrat—whose contested seat will ultimately be left in Republican hands—into siding with the president. The nuts-and-bolts work of politics has rarely been presented as such a combination of filth and nobility. At the center of it all is Lincoln himself, captured in a performance by Day-Lewis that may be even more astonishing than the hosannas he’s received thus far. Kushner’s script gives Lincoln a propensity for sharing folksy anecdotes and remaining personally in contact with average citizens and soldiers, making it clear how the president’s interpersonal skills allowed him to nudge people toward his own goals. Yet Lincoln is also a fascinating case study in “uneasy lies the head that wears the crown,” as we see Lincoln repeatedly struggle with ethically or legally questionable decisions as necessary for the greater good, or phrasing a statement to Congress with just the lawyerly turn of phrase that will make it technically true—moments that should give contemporary viewers on both sides of the political spectrum pause. It’s a complex, layered portrayal that’s riveting nearly every moment Day-Lewis is onscreen. If there’s an exception, it comes in the moments when Lincoln focuses on the president’s personal life, including his relationships with his emotionally fragile wife, Mary (Sally Field), and his oldest son, Robert (Joseph Gordon-Levitt), a college student who wants to join the war effort against his parents’ desires. The attempts to convey personal issues also tugging at a president’s sleeve are never nearly as compelling as the story behind the political maneuvering, and Spielberg indulges in some of his most unwelcome tendency toward melodrama when Lincoln and Mary quarrel in the White House while a literal storm rages outside their window. There’s a much more effective glimpse at the man behind the speeches and the stovepipe hat in the thankless work he does in order to make history. Lincoln is far from an act of hero worship. As we see at last when we realize how much of his principle Thaddeus Stevens could be sacrificing by backing down, it’s an epic celebration of pragmatism that dares us to see the word “compromise” as a thing of beauty.